The project attracted organizations from across the state, representing a variety of sectors, from social services to environmental advocacy. Now in its eighth year, the annual survey gives a voice to nonprofit-sector employees by asking them to rate their satisfaction with 20 workplace practices. 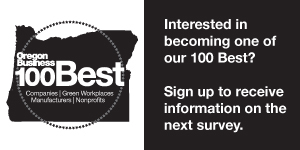 The 100 Best list showcases organizations that are exceptional places to work based on employee feedback to the survey. If you'd like more detailed information about the 100 Best Nonprofit Workplaces, download the list here. Congratulations to all these terrific nonprofits. Here in Marion and Polk counties we are especially proud of our nonprofits, including Bridgeway Recovery Services, Capital Manor, Start Making a Reader Today, Mid-Willamette Valley Community Action Agency and Willamette Heritage Center.